Historiated initial B on the frontispiece of a Psalter, illuminated by a Bolognese artist from the circle of the Master of 1446. In the Western tradition, no book was recited so often and brought so much comfort and pleasure as did the biblical book of the Psalms. Therefore, the opening page of a medieval illuminated Psalter often bears rich testimony to this genuine joy and intense gratitude, in most vibrant colours and lush decoration. 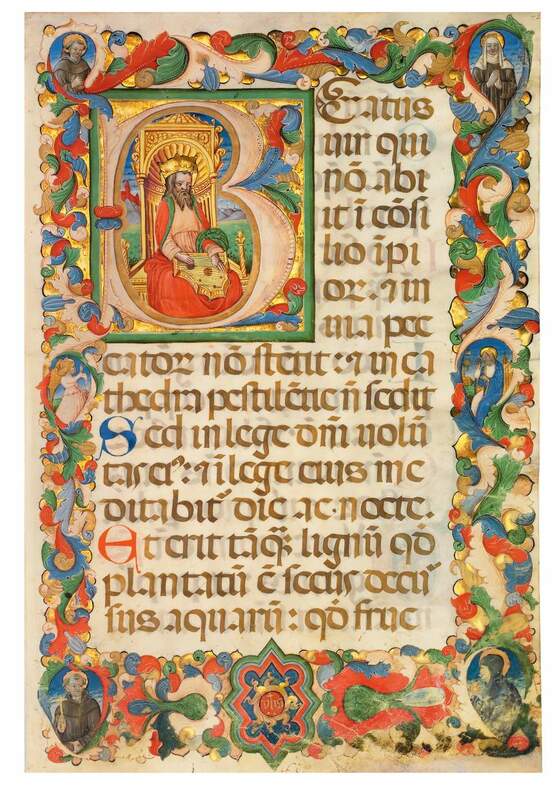 This large initial B, showing King David seated on a throne and playing the psaltery, introduces Psalm 1. This lavishly decorated book was made for use in a Franciscan monastery as is suggested by the Franciscan saints incorporated into the rich border foliage. St. Anthony of Padua and St. Clare are depicted in the upper corners, while St. Francis and St. Bernardino of Siena fill the lower. The remaining roundels depict the Annunciation and the sun symbol of St. Bernardino. The latter was the central figure of the Franciscan Observants, the reformed branch of the Franciscan Order. His aureole identifies him as a canonized saint and the year of his canonization, 1450, provides a safe terminus post quem for this fine leaf. Our leaf marks the end of late Gothic illumination in Bologna and represents a turning point in Bolognese book illumination, as seen in the classical elements of David's architectural throne.